Richard Elwes’ book is my new favorite … of 2014. 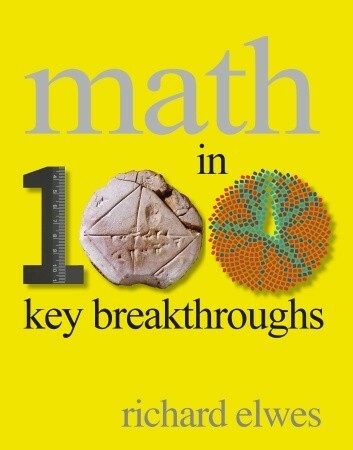 Math in 100 Key Breakthroughs is something of a coffee table book–I almost missed it because it was stashed at the bottom of the new book shelf at the public library. Dr Elwes presents the history of math from pre-history to the present day. If I had a book like this when I was a teenager, it would have been my favorite of all time. The program here is a constant pattern: one page illustrates something of the discovery, either literally or symbolically. The author condenses the breakthrough in three pages. Those few pages aren’t enough to explain the hugely complex aspects of math, but they are enough to give a good idea. Then the author moves on. The history aspect is fabulous. So far I’ve passed from Greek mathematicians to the Muslim researchers of the Middle Ages, and now to 17th century Europe in the first quarter of the book. That gives a good sense of the passing of the baton between different ages and cultures. I think the photography makes for a pleasant viewing if you dislike math. My sense is that a background in and love for math makes this book hugely enjoyable. I finished breakthroughs 21 through 24 last night and went to sleep amazed at a thought I never had considered before. I plan to be delighted as I continue through this heavy tome. Great gift book for a math geek. (That’s not a hint.) Check it out at the library, and tell me what you think. This entry was posted in On My Bookshelf and tagged history of science, mathematics. Bookmark the permalink.